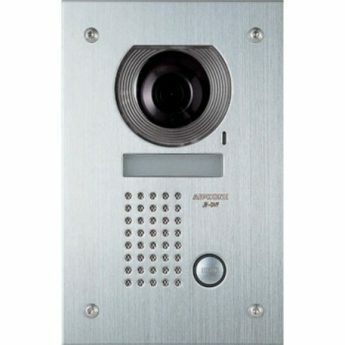 The JF Series is a high performance, hands-free video intercom with a quality monitor and an amazingly slim design. It is easy to operate and requires little time to install. The JF Series offers a simple and effective security solution. Both hands-free & press-to-talk communicationsWhen a call comes in, press the TALK button to begin a hands-free conversation. In a noisy environment, Press-to-talk mode provides a clear conversation. LED light indicates who is speaking LED lights turn on when you talk and turn off as you listen. Entrance monitoringEnables you to monitor the area around the Door Station without inside sound transmitted to the Door Station, ensuring privacy.